Twins mean double the joy for everyone. It’s also double the trouble. There are two things in life, for which we are never indeed prepared: twins! (Josh Billings). Now, you’re wondering about the best products, including the best baby monitor for your little treasure’s room to keep an eye on them on all the time. Right? A monitor will give you peace of mind allowing you to see or even hear your children when you are no longer in the same room. But the problem is to find out the best baby monitor for twins from a lot of options. To make things easier for a working mom who doesn’t have the luxury of time to choose among the vast array of these helpful devices, here are the best quality and affordable baby monitors she can consider. Hopefully, this will make your decision a bit easier and get the best value for your hard earned money. To help you make an informed choice, we have put together a list of the top-rated baby monitors for twins & two room based on performance, functionality, quality, durability, price, user recommendations and more. If you’re planning to keep both of your babies in the same room, then Infant Optics DXR-8 is for you. This monitor allows you to get a panoramic view, so you can observe every area of your own nursery. You can also make it move horizontally and vertically as well. Think of it as a “robot” monitor. From the design perspective, the DXR-8 comes with a camera and a screen, of course. The camera has a fascinating circular construction that is composed of 8 LED sensors. It ensures a higher level of visibility during night. On the other side, the 3.5-inch LCD monitor is very compact and provides crystal clear images. Now let’s talk about the performance. This unit is first of all, really secure in terms of privacy because it uses 2.4GHz FHSS wireless transmissions. So, you shouldn’t stress about anything. Moreover, its interchangeable optical lens capability allows you to have a clear sign of what is your baby doing. We also want to inform you that the unit is expandable to up to 4 cameras which is impressive in our opinion. Ohh, don’t forget to consider Infant Optics Add-On Camera Unit For Dxr-8 if you planning to keep your babies in different rooms. Another great thing about this monitor is its room temperature sensor. So, you can know what the temperature in your baby’s room is. The monitor’s battery life is 8 hours when it is continuously on and 12 hours in power save mode as the manufacturer’s claim. However, take in mind, this may vary. But either way, it’ll serve you just fine. To conclude, the Infant optics DXR-8 is worthy of considering and if you ever decide to purchase it, you’ll be more than satisfied with its performance. It works just like a professional camera system. Sleek and compact design with sound-activated lights and retractable antenna. Plug and play – no setup is required at all. The “OK” button due to strange reason is set on the top right instead of the center. But don’t worry, you’ll be getting used to it. 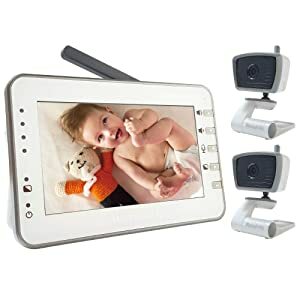 The summer infant Digital Color Video Baby Monitor is a good option for you if you want to keep your twins in separate rooms. This monitor comes with two cameras, and it has a large screen that will automatically enhance your visual reach. The camera and 3.5-inch high-resolution monitor features a sleek white color screen, and when combined they look absolutely beautiful. There’s a sound activated LED light that will notify you about the noise level that comes from your babies. On the other side, the camera itself features an adjustable swivel design. So, regardless of where you intend to position it, the camera will cover primarily every single space of your room. The summer infant integrates night vision capabilities that will maximize your visibility. Also, there are Infra-red LEDs that will automatically adjust themselves to your room’s light. What we like most about this product is its split screen technology and expandable system that will let you add two more cameras and place them in four different rooms which is great if you have twins. Moreover, 600- Ft. range will ensure that you don’t have to be restricted regarding staying in a specific room. So you can take a breath in relax in different rooms. The summer infant has a rechargeable battery with an estimated lifespan of up to 6 hours which is good enough to accompany you to several day naps or long night naps. Before we end, we also want to mention that the monitor system has a built-in digital zoom on which you can always rely on. Overall, we recommend you consider this baby monitor as your next purchase because it is reasonably priced yet performs like a premium one. 100% digital technology offers a private and secure connection. Easy to set up. Plug and play set up is ready to use right out of the box. Remote all-around scan ability of the room. No need to physically adjust the camera. The split screen feature won’t let you hear the sound from both rooms. You can only hear the sound from one room at a time. You also need to switch the audio manually. 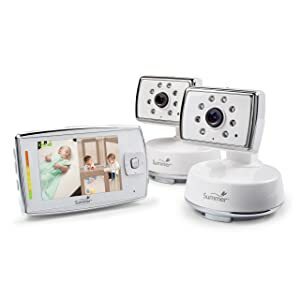 If you’re looking for a way to stay connected to your little angels from up to 1,000 feet distance, then this baby monitor with night vision and two cameras can be a great option for you. Not only that, you can observe your babies even at night in the dark room without disturbing them. It’s eight infrared LED’s along with its high-resolution, 2.8-inch color LCD screen automatically detect dim light that provides a clear vision even in dark rooms. One of the nice features of this unit is it uses DECT 6.0 digital technology allows you to hear clearly every tiny giggle, gurgle, and hiccup of your babies. Moreover, the system is expandable that can support up to 4 baby units. Its full-motion dynamic video with up to 22 frames per second lets you watch your baby’s every movement. Moreover, it’s undoubtedly one of the best baby monitor for 2 rooms, 4 rooms too. It supports 4-cameras that include dual views, single view, and the quad view split screen that allows you to view 4 rooms at the same time. One more thing that we like to add here that its built-in talk-back intercom with the 6-level sound indicator on the portable parent unit. It’s a convenient feature to comfort your babies from any other room. To conclude, the product is cheap in price but not cheap in quality! Easy to set-up and wall- mountable. You can quickly change the setting of the camera, so your little ones are always in full view. Five in-built calming lullabies charm your babies to fall asleep. The room temperature sensor allows you to know the temperature of your treasurer’s room. Some users complained that the parent monitor doesn’t stay charged for a very long period. Looking for a smart solution to keep a watchful eye on your babies when away on compatible tablets, smartphones, iPad or computers? 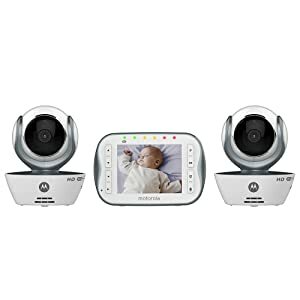 Then, you won’t go wrong with Motorola MBP843CONNECT WiFi Video Baby Monitor. First of all, the MBP843 comes with two fully functional cameras and a comprehensive parent unit which make an excellent value. The parent unit has complete control over both the cameras. The 3.5-inch color display lets you watch your babies in gorgeous detail. The adjustable camera allows you to zoom, pan and even tilt as needed. Not only that, it features the high-quality infra-red video streaming for night-vision that will help you to monitor your children even at dark. We also want to add here that the unit features temperature notification, sound-level indicator, out-of-range alert and low-battery alert. That means, it’ll keep you aware of all the times. Furthermore, the two-way communication let you talk with your children from a distance place. This unit emits relaxing five lullabies that will keep your babies entertained and calm for many years to come. It works with Hubble app that allows you to receive temperature notifications, motion, and sound to your device. Sleek and compact design, highly portable. It does not have a split screen. So, it doesn’t offer simultaneous monitoring of multiple rooms. Lacks of backlit in buttons makes it difficult to see at night. Next up on our list is Babysense with two digital cameras, one of the most affordable baby monitor on the market today. For those who don’t know, Babysense monitors, developed and produced by Hisense Ltd company, are proven and trusted in the world wide. When it comes to buying a high-quality, long-range video baby monitor, you should consider babysense. 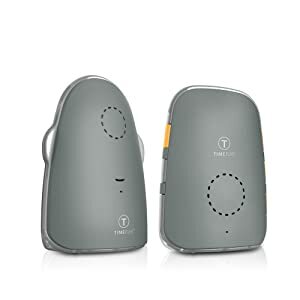 This monitor lets you maintain a private and secure connection and hear your little angels with crystal clear sound quality at all times from about 900 ft. distance. Its 2.4-inch color LCD screen integrates with 2.4GHz FHSS technology that ensures secure interference-free connection, stable streaming, and crystal clear digital vision & sound. That means you can always monitor your sleeping or playing little ones all the time. Moreover, the infra-red night vision automatically adjusts to the dim light. So, you can have a clear view even in the dark rooms. It also has an ECO mode that shuts the monitor off (at night for example) to save battery until. It will automatically light up and start transmitting sound and video signal once the camera detects any sounds. What’s more, you must like about this product is its two-way talk-back communication and pre-programmed lullabies and scheduled alerts that will let you set up diaper changing, medication, and feeding in time. It’s out of range warning, low battery warning, high / low-temperature alarm, sound activated led indicator will always keep you aware of your babies’ room and conditions. You can move the parent unit with you that enables you to see or talk, hear your babies no matter where you’re in the house. The two-way talkback communication system allows you to comfort your babies with your voice. 2x Digital Zoom lets you keep a vigilant eye more closely. ECO Mode is a convenient feature that lets you control the sound activation level (Low, Medium or High). The camera’s power cord is somewhat short. However, an extension cord is helpful to solve the issue. The next product we are looking at is the DBPOWER Digital Sound-Activated Video Record Baby Monitor. This product comes with pretty much all the bells and whistles you require to ensure your baby with security and safety that your baby needs as well as for yourself. First of all, it’s one of the most advanced and well-designed baby monitors available in the market today. Its video recording system lets you record each precious moment of your baby. Even when you’re not in your home, you can still capture those priceless moments. Moreover, its sound-triggered video recording function automatically triggers the DVR functions when a sound is made. Oh yes, parents must love its split-Screen 4.3-inch large Display with multi-camera (up to 4 cameras) expandability. Its 2.4GHz FHSS technology lets the parents monitor their babies from 1000 ft. distance. The night vision features the light sensor that automatically detects the conditions of light as well as night and daytime mode. You can watch your baby up to a maximum of 15 feet with extended vision in the dark during the night hours. So, how can parents not like these advanced features? This unit is also loaded with other smart features such as two-way talkback function, a nightlight, room temperature indicator including an alert, lullabies and much more. And Price? It comes at an unbelievably affordable price for such advanced features. User-friendly interface and trouble-free when it comes to installing. The remote pan, tilt and zoom option and a compatible mounting self to get enhanced viewing. The speaker features volume control from the parent unit that lets you choose the setting of the voice volume and lullabies. Some users complaint its poor battery life. If you are looking for a baby monitor packed with advanced functions like 360-degree manual rotation and Smart Voice Activation, MoonBaby is definitely worth checking out. The big, bright LCD monitor has useful features like night vision and a temperature sensor to ensure optimal security and comfort throughout the day. The device operates on a fully wireless, interference-free 24 GHz signal. You can expect to receive lag-free feed from the cameras, even if the baby rooms are upstairs and you’re working downstairs. All these without any internet connection. You can also manually rotate the camera in any direction you want for a better view. What’s even more fascinating is that you can upgrade it as a whole house monitoring system by adding up to 4 cameras. We also loved how seamlessly one can switch between the two existing cameras. Another significant addition in the monitor is the Talk Back feature. It allows you to communicate with your kids with a single press of a button. This will help you soothe your kids without visiting their rooms. Sometimes they wake up at night for no reason and going to their room might disturb their sleep even more. Actually, come to think of it, it will be a great way to sleep train your twins as well. The only gripe we have is that the battery doesn’t last for as long as advertised, even on the power-saving from. Apart from this, this model easily qualifies as one of the best video baby monitors for twins. Includes two cameras that can be switched instantly. Has great picture quality, day and night vision. Operates fully wirelessly within a range of 1000 feet. It beeps really loudly when the battery is low which may awake your sleepy baby. Excellent audio clarity, no interference thanks to DECT technology, and simple setup are key benefits of this baby audio monitor. We would recommend this to parents who want to keep their twins in a single room. To be able to hear them more clearly, consider keeping the cribs closer to each other. Another feature that makes this monitor stand out is that the data the fully encrypted data transmission. This way, you don’t have to worry about intruders listening to the audio. There’s a talk back feature that helps you soothe your babies when you can’t immediately reach them physically. Babies are extremely sensitive to temperature changes, which is why the temperature sensor on the device will always come in handy. We also loved the fact that it has a nightlight which is neither too dim nor too dark. This, along with pre-recorded lullabies, will ensure a warm and comforting environment for your kids during bedtime. Zero audio interference and clean audio. The batteries in the parent unit is impressive can last probably 20 hours before they have to be recharged. Easy to link and set up. You can’t control the music & night light from the parent unit and the light isn’t very effective as a night light. TimeFlys has all the essential features one looks for in a high-quality audio monitor. Be it nice and clean audio or modern European sandwich design- it scores high in every department. On the brighter side, the soothing nightlight in the middle of the monitor will help your twins sleep peacefully at night. We know that most babies are scared of sleeping in fully dark rooms. So another thumbs up for this. We also noticed that it comes with a USB connector to allow outdoor use, a minor but important addition. What further makes it great for outdoor use is its ability to be charged by a power bank. Suppose you and your friends are out for a picnic and all the kids are playing inside the house. This will be a great way to keep tabs on their activities while you’re chilling with your friends. Even its indoor use is as good as it gets. The signal almost never gets disrupted by the signal of other electromagnetic devices. There’s a push to talk button to help you comfort your babies from another room. Coming to the battery life, 15 hours of backup with one single charge is quite a deal for this price range. The sound alerts for parent console going out of range and low battery just further make your life easier. You can control the night light on/off from the parent unit. The unit is portable and very lightweight,can be used outdoors. 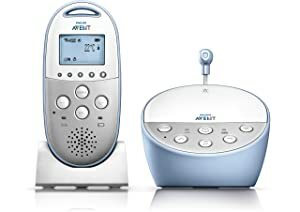 2-way audio for communication with your babies. It filters out background noise. I don’t find any major issue. If you are still wondering what is the best baby monitor for two rooms within an easily affordable range, here’s another option for you. The portable TFT-LCD screen of the device displays crystal-clear image with clean audio, even under low light conditions. The zooming feature of the display is really powerful, in fact, one of the best in our opinion. By using the Scan Cam function, you can let the monitor switch the 2 cams automatically in every 8 seconds. Convenience at its best. It uses an advanced 2.4 GHz interference-free tech to ensure superior video quality, data privacy, and lossless data transmission. The coverage of 800 ft. is decent enough for standard-size apartments. Just like all quality baby monitors, this too utilizes 2-way audio for letting you instantly respond to your kids. However, note that the average battery life of this device is 8 hours which is not a lot. But thankfully it has a low battery alert and you can use the monitor even while charging. Easy plug and play mechanism, easy-to-use. The monitor can switch the cameras automatically in every 8 seconds. Clear and detailed video display. I wish that it had a splint screen to see both cameras at the same time. A baby monitor- Is it “must have” or “nice to have” on your list? Let me start by saying, if you have twins and planned NOT to co-sleep, a baby monitor is definitely one of the “must-have” products. Thanks to modern technology, a baby monitor is much more convenient and feasible, and it makes the lives of every parent so much easier. It helps anxious parents get a better night’s sleep. However, don’t let this parent anxiety go too far. There will come a time when you have to stop using the baby monitor. In case you’re not sure when it’s the right time to stop, you can refer to this article. Baby monitors give you the chance to watch every movement of your baby all the time. They come in handy if you live in a large house, and your baby’s room is some way from the living areas or kitchen of your home. You don’t need to be worried about going to the baby’s room every minute just to see them. 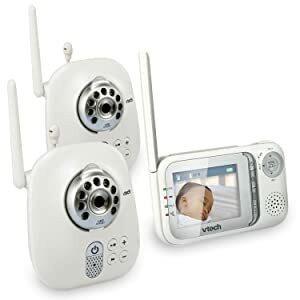 One of the biggest advantages of having a baby monitor, especially video monitor, is the security of your baby both inside and outside of the crib. Some high-end monitors have movement and temperature monitoring systems. 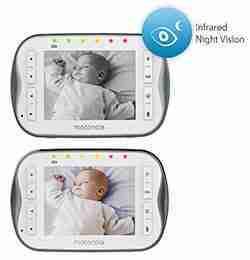 Some units also have night vision feature that helps parents to see the baby even in the dark room. Also, during the playing time, your baby tends to try and get out of the crib. They may get hurt. A video monitor helps parents or caregiver to be aware of these situations and prevent the incidents so that they are not about to get themselves into trouble. If you’re not a stay-at-home parent, you can link up to your home Wi-Fi network through the baby monitor having cloud service and sharing. This feature also helps you to save the video and watch it later to make sure your little ones getting proper caring. You may use this monitor as security cameras if positioned effectively. Some models have the option to connect multiple cameras. You can’t imagine how useful this feature is if you have twins, they are in separate rooms and need to monitor them at the same time. 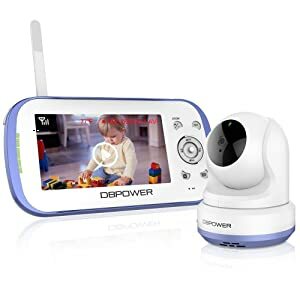 If you like to build a huge nursery for your babies to roam around, a baby monitor having multiple camera add-on features will make your job easy and effortless. Thus, it’ll help you to manage your children more effectively. 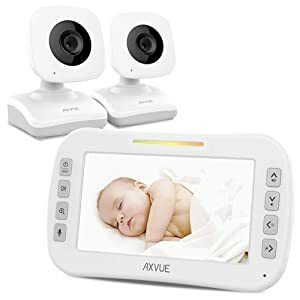 Choose the best baby monitor for multiple children or twins to make sure about the most reliable method to monitor your little ones from anywhere anytime. Want to know what to look while buying a baby monitor for twins? Read on to discover the answer! The baby monitor you’re deciding to buy should have a good quality range so that you can monitor even when at the end of your house. It also must be able to pick up any soft sound. If the baby monitor uses common radio frequencies, it may interfere with other nearby devices. However, the baby monitors that use DECT technology offer less interference and ensure the most transparent sound. Go for the battery operated unit. If the monitor is only run from the mains, it won’t be convenient for you to use in some areas like in the laundry room or garden. You require to keep the baby monitor almost always on. Do you like to run to the store for batteries every few days? So, pick the model that works with a rechargeable battery. The infrared camera is an essential feature to monitor your baby in the dark room. Some models use infra-red technology that adjusts with the darkness of the room and transmits images of your baby. Multiple Kids = Multiple Cameras. Yes, it’s an essential feature if you’ve twins or multiple kids and keep them in different rooms. Pick the model that let you connect additional cameras. You can set up the cameras in different rooms for keeping better track of what’s going on at every moment. The two-way communication system allows you to respond to your baby immediately and soothe bub from another room. Remote communication is also possible with the monitors through the network and some apps. 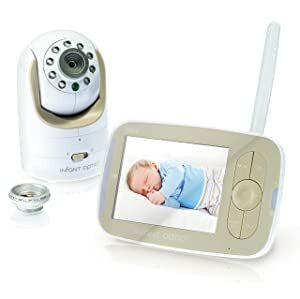 Some baby monitors come with amazing add-ons like nightlight, low battery indicator, room temperature indicator, volume control, SD card slot to record video and sound, lullabies and much more. These nice-to-haves are indeed lovely to have in a baby monitor. Install and test the baby monitor before your baby/twins come home. So, which one is the best monitor among the best for surveilling twins? We’ve invested significant time and energy into researching and testing the best baby monitor for twins. Though we’ve found any of these choices would be excellent for your little treasurer’s room, our ultimate winner is the Infant Optics DXR-8 with Interchangeable Optical Lens Video Baby Monitor. But, what makes it the winner? Well, apart from being #1 bestseller in baby monitors, it comes with many more useful features including the brilliant video quality, retractable antenna to enhance range, immense battery life, and interchangeable lens capability. One of the unique features of this monitor is its ability to use different lenses (regular, zoom 2x, and wide angle). Another great benefit to this baby monitor is the price. You could easily pay two or three times as much for a comparable baby monitor and still not feel the security you’ll experience from this unit. Get The Best One For Your Precious Babies!